Running toward the Emerald City. After six months of training — aka six months of giving up cocktails on Friday nights, sleeping in on Saturday mornings and even some weekend trips — I was finally ready for my first marathon ever, the 23rd Los Angeles Marathon…or at least as ready as I’d ever be. Marathon morning my L.A. Roadrunner pace group met up at the Ralphs parking lot near the start line beforehand and then we made our way to the corrals. Funny thing is that I don’t even remember that long walk but next thing I know we’re standing in front of that yellow banner. Over the loud speaker I could barely make out the announcement of the handcrank wheelchairs’ start or the memorial for a recently fallen LAPD officer. And I don’t think I even heard the pistol signaling the start of the marathon but next thing I know, we’re all moving en masse beneath and past the yellow banner. Our first struggle was the Cahuenga uphill leaving Universal City. “Swing your arms and take baby steps,” I kept telling myself, something I picked up during all those Saturday morning runs with the Roadrunners as we had run up the Santa Monica Pier. This Cahuenga hill was a long one but I made it to the top and crested it easily. And going down the other side I kept telling my running partner Mei-Mei, “Take shorter strides” so that she wouldn’t mess up her knee or get shin splints. With her long legs, she tends to take big steps. “Thanks, Caroline,” she said breathlessly. We ran down past the Hollywood Bowl and at Mile 4 hit near Hollywood and Cahuenga. That was the first water station and it was chaos with people darting in front of me to get to the sacred water cup, everyone trying not to slip on the crushed cups and spilled water and Gatorade on the ground, and runners trying to avoid well-meaning but stationary volunteers in the way. 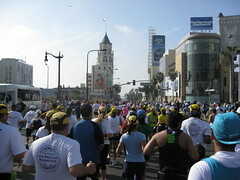 When we made that first turn of the marathon down Hollywood Boulevard, I almost cried for some reason. “We’re actually doing this and we’ve still got a long way to go,” I thought. Meanwhile, the spectators lining the Hollywood streets were so happy and encouraging, jumping up and down and yelling out names. But since I was surrounded by my pace group I didn’t get to have my name shouted out. Rather we were known as “Team Yellow Hats” since a lot of our members were sporting the yellow team hats bought during our training days to help identify us from the other pace groups. The rest of the run was a blur. I remember a running Elvis wearing a white jumpsuit and pushing a boombox that was blasting on “Suspicious Minds.” No, I wasn’t hallucinating. I remember being extremely annoyed by all the student runners (Students Run LA) who kept getting in the way and who seemed to have no awareness of other runners as they cut people off or stopped short in front of people. Arrggh! Kids! I even got annoyed with a couple of guys in my own pace group whom Mei-Mei calls “Team Donkey Kong” for their bullying gorilla ways. For some reason they always had to run in front of us. Mei-Mei and I would run ahead, slipping in front of some runners near the front of our group and then here comes Team Donkey Kong huffing and puffing alongside and then bullying and wheezing their way in front of us. This happened several times and this behavior has dated back to even our Saturday training runs. Really. WTF? It’s annoying because not only were their sturdy frames blocking our view of the road but their coughing and labored breathing were very disconcerting AND not something I needed when I was enduring struggles of my own. At Mile 14, I dropped out of my pace group. They ended up running at a much faster pace than they were supposed to. And I kept thinking about what one experienced marathoner once told me, “Don’t worry about the time, just focus on finishing and have fun.” So I dropped back and tried to enjoy the day…the long, lonnnng day. Fortunately for the spectators it was a beautiful sunny day, however this didn’t bode well for the runners as it seemed like everyone was walking, beaten down by the heat. I saw one man lying on his back in the shade of a bridge while two other runners called a couple of cops on bikes over. I started running again but looked back hoping he was OK.
Toward the end of the course, a lot of the water stations ran out of Gatorade. Bad considering at Mile 21 your body really needs those electrolytes. Also it seemed like the water stations on those last miles weren’t as together as the earlier ones. Several different times I had to tap people on the shoulder to ask for water as they were so distracted with each other. But I was glad that there was a station at every mile at least. Through the race, I kept in touch with my bf whenever I could by text messages, letting him know which mile marker I was currently passing. 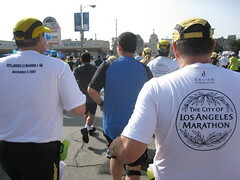 Having missed him at Mile 10, I saw him for the first time on the course at Mile 19 near the Staples Center where he was standing at the bend holding up a “Run Caroline on Crack Run” sign with a big smile on his face. I only had enough energy to run up to him and give him a peck and then run off again. Turns out he appreciated my texts as the text alerts from the L.A. Marathon only provided split times, rendering it useless for keeping track of where I was on the course. And since I was slowing down considerably during the last 5 miles, there was no way to predict when I’d come in. I walked most of the last part but ran when I could. I had no more energy, I was terribly hungry but I had no more peanut butter pretzels left and I couldn’t stomach another drop of water. Plus my feet were hurting something awful so at one point I went to the side of the road and pulled off my shoe and peeled off my socks to check out my feet. Yup, blisters. Surprising considering the great care I had taken to put Body Glide and bandages on my feet, even wore two socks on each foot. But I made myself run through the pain. And during these last miles I felt different muscles on my legs threatening to spasm but they never did, thank goodness. Unfortunately there were many other runners who weren’t as lucky as I’d see them limping along, while others were carried by their friends. And there were even some runners who ran despite the pain, swinging their one stiff leg around so they wouldn’t have to bend their sore knee. Ouch. My bf texted me that he’d see me in front of Seven Grand since the course ran past it. Too bad it wasn’t open though. Talk about drinking the pain away. Heh. And I did see him, he was holding up the sign again and cheering me on even though, at this point I was walking, too tired to keep up the pretense of running. But he said that I was almost finished. “I am?” I asked feebly. The finish line was just around the corner, up Flower and 5th so I started running again. I ran past that 26th mile marker and up Flower toward the end. At this point I noticed that everyone around me started running again, too. We were all invigorated by the end being so near. But when I got to 6th I was tempted to stop. Sooo tired. And then I thought how lame would that be if I just strolled to the finish line? So I pushed myself and gathered up all that I had left to charge to the end. A line of people dressed in orange jumpsuits directed us through the chutes. I kept going til I stopped in front of a little boy who put the medal around my neck. Huzzah! Surprisingly, I didn’t cry. I thought for sure I would at this point, but not a tear. Then I limped around looking for Mei-Mei who had finished 8 minutes ahead of me. A group of firemen stood by a stable of ready wheelchairs while marathon workers went up to dazed and confused-looking people to ask them if they were feeling all right. I guess I looked fine as both groups let me pass. OK, so I finished the marathon in 5:49. Not my pace group’s anticipated time of 5:30 and definitely a lot slower than Katie Holmes’ New York Marathon time (damn! I so wanted to beat her!) but I did finish it. This was the hardest thing that I’ve ever made myself do, and many times during the 28 weeks’ of training and through the marathon I thought that maybe I’d drop out or get injured. But I stuck to it through the end. Yayyy! AND I succeeded in fulfilling my personal goal of running up that last hill at Mile 22. When I did a preview run of the last 7 miles of the course a couple of weeks ago, I swore to myself that despite those previous 21 miles I’d run up that hill while all others walked it. And I did! That was my small victory. So would I do this again? No way! I think I’ll stick to half marathons. But of course, veteran marathoners tell me that I may swear off marathons now but come April I’ll be itching to go again. And to that I say, “H’yeah right!” Running is fun, but for me, 26.2 miles of it aren’t. That takes passion and determination and drive, all of which I used up on this event. OK, I’m done talking about it. 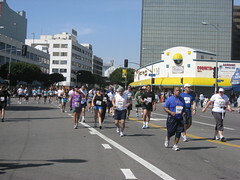 More pictures of the L.A. Marathon. Congrats on finishing the marathon–that’s so impressive!! Hope you’re enjoying some well-deserved rest. Congratulations — you are my idol! What an accomplishment. Hope your feet are feeling better! Wow! A 26 mile post! Congrats! Congratulations, it is a huge accomplishment. I did one in 2003 in Alaska with Team in Training, you beat my time (I was fighting the IT Band injury), however I have to admit I did cry at the end! I swore off marathons too and have told myself I need to do a half, but here I am still not running! But you may have just given me some inspiration. Thanks Caroline! OMG! I finished in 5:40! I *knew* I saw your bf with that sign! But by the end I was pretty much “out of it” mentally, just running on fumes. I agree that it was monumentally frustrating that so many water stations were out of Gatorade towards the end. And it was also annoying that the water stations seemed to be less frequent when I wanted them the most. It was *not* like that in ’06 and ’07. They definitely had some planning issues this year. I also agree about the kids in the blue shirts — Students Run LA. They were driving me crazy. Bravo! Bravo! That’s amazing! 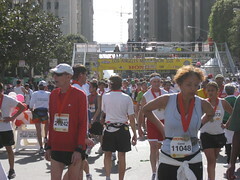 I was working as a volunteer and now i am preparing myself for the 2009 marathon! NOw you can enjoy all the cocktails you want! Thanks, peeps! Yeah, it’s cupcakes and cocktails from now on! I kid…sorta. Congratulations on your victory! Good job! I think it’s time you celebrated by having a get together at Seven Grand. Gimme a call! Congratulations on what clearly amounts to a marathon of achievement. Such a good post, and I’m glad you got that well-deserved massage too! Time for cocktails! Don’t know if he was the same one. I was astounded at the “costumes” some people were wearing. One woman had on a Mexican wrestling mask. I was,like, you’re going to run 26 miles wearing that???? 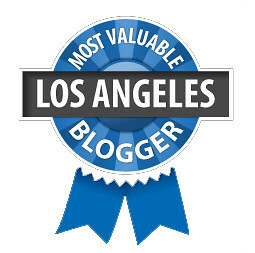 Anyhoo – great accomplishment Caroline! I don’t have the knees to run, but your story has me considering training for the AIDS bike ride from San Francisco to L.A.
Rest up and enjoy those Friday night cocktails once more! That’s a good idea. How about this Friday? I’m not running Saturday. Yayyy! LOL If I can do it with training ANYone could. 🙂 Thanks though. Yes, yes it is. Are you down for Friday? Yeah, LAist showed people dressed as Slash. So weird. I would think the wigs and stuff would come off by the time they got to the finish line. As for the AIDS bike ride from SF to LA, I’ve ALWAYS wanted to do that! Hmmm…..
Well, if you ever looking for a training buddy for that ride, you know where to find her! You must have been running in LARR Group 12? Thats very impressive, a LA Road Runner with a nice blog! I completed the LA Marathon also. I am sure you will be training again in September. Again congrats on finishing and on your time! Actually I was in Run/Walk 2. Thanks, though! Run/Walk 2 is at an impressive 12:30 pace!!! That must help save your legs? I had to walk the last 5 miles. If its a R7/W3, what is the actually pace of the R?